Samsung’s rivalry with Apple will continue to be the battle of the ages, but the tech giant has also been a long-term component supplier for the California-based firm, so it should not come as a surprise that a part of Samsung is actually present inside the 13 and 15-inch MacBook Pro family that feature the Touch Bar and Touch ID. According to industry insiders, the Touch Bar is an OLED panel from Samsung Display’s A2 line and the reason why Apple opted for it was because it is thinner than conventional OLED panels, allowing the company to reduce the thickness of its latest generation notebooks. On top of that, Samsung’s reputation as the leading OLED supplier in the world as well as incorporating one of the best smartphone displays on the planet has allowed the company to garner a list of clients over these years. The report also states that the driver control integrated circuit has been supplied by Samsung, and its System LSI division is said to have supplied this crucial component which basically links the laptop to the Touch Bar. Using the OLED tech from Samsung, the Touch Bar resonates vibrant colors that will also be able to get viewed comfortably in areas where there is a substantial amount of surrounding light. 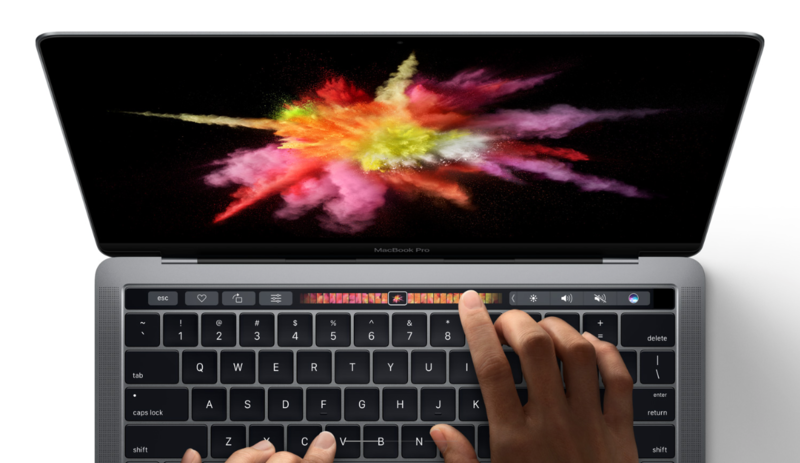 The Touch Bar replaces the function keyboard layout on the 13 and 15-inch MacBook Pro models and allows you to get a miniature version of the OS running on the notebook through this display. It has also been integrated with Touch ID, which will effortlessly allow you to lock and unlock your notebook without the need of a password, and you will be able to pay through Apple Pay using the Touch ID interface as well. However, pricing is going to be a major concern for consumers because the base model of the MacBook Pro that features a Touch Bar starts from $1,799. You can opt to purchase 13-inch MacBook Pro, which starts from $1,499, but you will not get the Touch Bar for that price tag.